If you’re reading this, than you’ve probably already heard about South Beach Smoke. It’s one of the hottest electronic cigarette brands right now, and that’s practically the main reason I decided to do a review of their product. With new names popping up in the business virtually every day, building a name for yourself is pretty tough, but South Beach Smoke has somehow managed to become one of the most popular e-cigarette companies in the world. But advertising and great marketing in general can be deceiving, and it’s time to see if SBS e-cigs live up to their reputation. 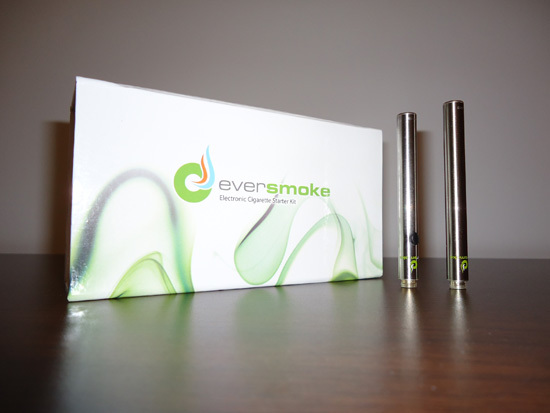 The kit comes in a small magnet-top box, branded with the South Beach Smoke logo. I like that it’s smaller than other starter kits I’ve used, makes it easier to carry, but it’s definitely not enough to make me get over its austere content. South Beach Smoke and I didn’t exactly start off on the right foot, but I was hoping the batteries would change my initial opinion. The SuperMAXX™ name sounded intriguing, and I was curious if there was more than branding behind it. 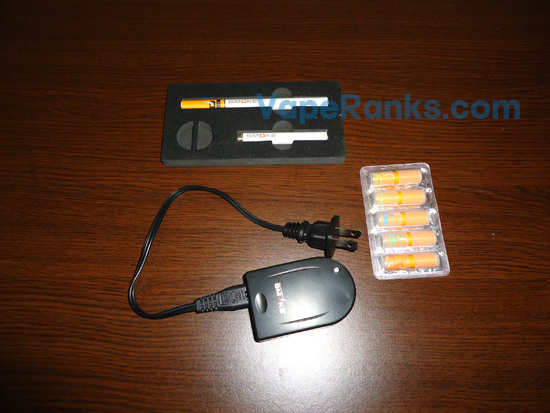 SBS uses one of the most advanced e-cigarette models, the KR808D, and that right there is a big plus. But that’s not all; while most KR808Ds are regulated at 3.7 volts, South Beach Smoke upped the power of its devices to 4.2 volts, which, depending on the resistance of the cartomizers, makes vapor hotter and requires less draw to produce an equivalent volume of vapor. 3.7 volts is my sweet spot, but I have to admit using these “supercharged” SuperMAXX™ batteries was a welcomed change of pace. You have to be careful what kind of cartomizers you use them with, though. I tried some Green Smoke cartos and got a burnt taste after only a couple of puffs. 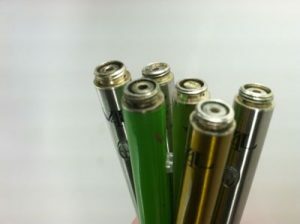 The reason I only tried them with Green Smoke cartomizers is very simple – the batteries have the same KR808D-2 threading. 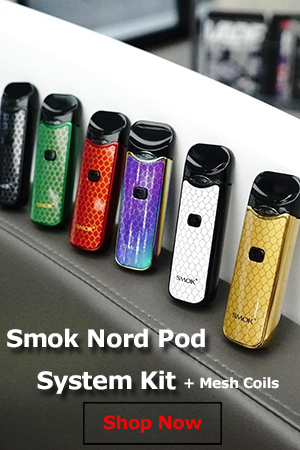 What that means is they are not compatible with the much more popular KR808D-1 accessories most e-cigarette suppliers sell. If you plan on being faithful to the few brands that actually use this threading, it’s not going to affect you at all, but this just strikes me as a gimmick some companies use to make sure customers keep buying their cartomizers, exclusively. Otherwise, the battery life was pretty satisfying – I got about 200 – 250 puffs out of the standard battery, and about 350 puffs out of the extra-capacity battery – the switch was responsive throughout the entire testing period, and the recessed crystal tip is a pretty nice touch. I expected a great vapor production from the 4.2-volt SuperMAXX™ batteries, and they didn’t disappoint. Practically every KR808D battery I’ve tried so far did very well in this department, and the South Beach Smoke was no exception. 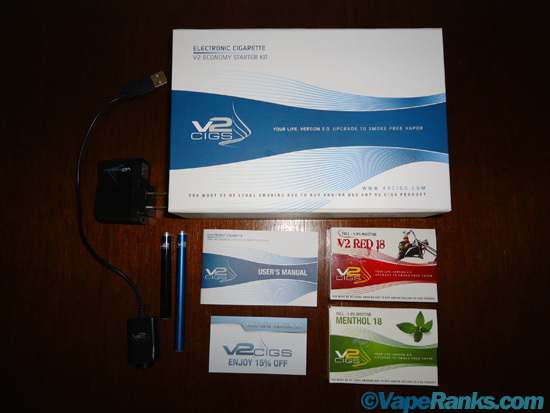 The kit I used for this review came with two automatic batteries, so I didn’t get a chance to test the manuals, but the ones we got produced great vapor. Like most automatic e-cigarettes, they perform best after a primer puff, but even without one, the volume and density of the vapor are very satisfying. The user manual and the company’s official site don’t seem to include a list of e-liquid ingredients, but judging by the high vapor production, they might be using a mix of propylene glycol and vegetable glycerine. I really have nothing bad to say about South Beach Smoke’s regarding vapor volume. It constantly produced white clouds, even when the batteries were nearly depleted, I got a nice throat hit from the 12 mg nicotine e-liquid, so obviously two thumbs up on this one. Another reason why I was looking for the ingredients in South Beach Smoke’s e-liquid is because I thought their flavors tasted funny. Now, I’ve tried dozens of different juices during my journey in the world of vapor. Obviously, some I liked more than others, but so far I’ve never tasted anything quite like the stuff SBS uses for its electronic cigarettes. And no, unfortunately I don’t mean that in a good way. The first flavor I tried was the tobacco, and I didn’t like it one bit. It had this weird musty taste that reminded me a lot of the taste I got in mouth when my mom forced me to swallow pills as a child. But this wasn’t the first time I had a bad first impression when trying new juice, so I continued vaping the stuff and hoping my taste buds would finally accept it. Sadly, after days of using the e-cigarette, I still got that medicinal taste. Worse still is the fact that all other South Beach Smoke flavors had the same strange base taste, some more potent than others. The Tobacco Gold, for example, was actually pretty nice, with a strong tobacco taste that actually made the medicinal aftertaste bearable. I know e-liquid contains various chemicals, but I don’t expect it to taste like it too. I even went online and searched for user reviews and their impressions on the e-liquid, but while some very few shared my opinion, most though South Beach Smoke flavors are great. That just goes to show you flavors are a matter of personal preference, and you should always try stuff for yourself. South Beach Smoke has 10 different flavors you can try, including three types of tobacco, menthol and peppermint. I have mixed feelings regarding the South Beach Smoke electronic cigarette, and if you’ve read through this review, I think you can understand why. I think their SuperMAXX™ batteries are great, I loved the awesome vapor production and the throat hit, but I couldn’t help but feel let down by the shady taste of the e-liquid (which I recommend they change) and the poor contents of the Deluxe Kit, especially the lack of a USB charger. South Beach Smoke may be one of the most popular e-cigarette brands of the moment, but I can think of a number of less known e-cigarettes that would put them to shame. south beach smoke is a wonderful company when it comes to their products and how they treat their customers. they do everything they claim to and then some. Absolutely a product I will be sticking with! The vapor- its no joke- a little goes a LONG way and the cartridges last me days each. 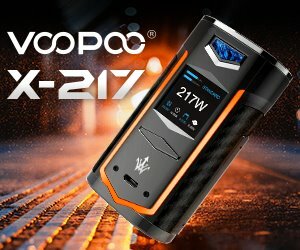 FINALLY an e-cigarette i am happy with. No ELATED with. The smoking is exactly how i wanted it, and I feel just as satisfied as I did with cigarettes. I’ve been using SBS for a year now and have been quite satisfied in all respects. They even sent me new batteries, chargers and a case for no charge when I mentioned I had been using them for a year my last order. As a former tobacco user, I couldn’t ask for a better product and service. I got the sensation of sucking on a hollow straw with these-not what you want when trying to replace the solid hit of a cig. The tobacco blue flavor was disgusting chocolate. Vapor production was not impressive at all. Sending it back. After so many screwed up shipping orders over the past two years, and then to ships me $600 bucks worth of product, and the Supervisor Amanda says, no problem, you will be given distributor pricing, and replacement…they now have reneged on the agreement. South Beach products are not the problem…it’s the telemarketers who are the problem. I didn’t like the feeling of not being able to blow more smoke like vapors while exhaling. The cartomizers are very expensive and attempting to purchase refilable ones that fit is very difficult. Buy a ecig with a different thread and save yourseld a lot of money. My rating is a 4 work out these problems i seem to be having… A True 5 for sure./// I smoked regular cigarette s for 35 years, unable to kick the habit, I got the south beach smoke Deluxe starter kit and having had to smoke a regular one in five weeks. I enjoy and recomend the bold or the full flavor Tabaco flavors. At times the batteries seem like they weather don’t burn right or they just don’t last as long. So when I called them about this the person who I spoke with sudgested that after charge ring tap the threaded side of the batteries fairly hard 6 to 9 times so I did and batterie life was better. Tell one day it stopped working all together. At that time I tapped it in the opposite detection and got it back working. It seems to me the contents inside the batteries are not secure and is causing this to happen. I can control the amount of vapor by doing this which I like but I wonder what all the tapping is doing to the batterie life. Ok now for the USB electric smoke. I have two S.B.S. USB wall chargers and two of the USB electrical cigarette’s for some reason the usb electric smoke won’t work with the USB wall chargers that they provide so I half to use my phone charger to make them work. They also don’t seem to produce as much vapor as the batteries do. I haven’t called them on this yet. I will update on this. One last thing I am wondering about xonstency of the amounts of fluid in the filter part of the e smoke this second batch of cartridges don’t ssem to be lasting as long. Even with these problems, Which I am sure they are aware of I will continue to buy the south beach smoke. I also havnt contacted them issue weather. I will also update on this. Than for reaching and vapor on!!! Like the product, but not the service. Extended my recurring shipment and they shipped it 11 days early. I wanted one pack of cartridges and they sent me 7. It was over $200 and they charged shipping. Tried to call and email several times. Call would not go through and the email would not come up. Had to close my credit card account so I would not be charged. Just a warning to let you know no customer service exists. Thanks for the information.I have been smoking for years and want to change to e cigarettes , but so many different brands exist. I have tried several different ones.What I am looking for is a e cigarette that doesn’t look like a pencil hanging out of my mouth.I want one that is equivalent to the size of a king size cigarette and has the same strength as the light cigarettes that I smoke.Think in have come to the conclusion I should smoke an e cigarette that I can purchase from a local store.So far the brand Blu comes pretty close to that .it produces the same smoke or vapor as my regular cigarette and also is about the same size as a king cigarette .Was wondering if anyone had any suggestions .I would like to try South Beach but want to know a little more about it and would actually like to try the ecigarette before I spend a lot of money on it. Not happy with battery life and the first two vapor cartridges lasted no more than 140 to 160 draws. Getting accustomed to taste but if the cartridges don’ t give better results cigarettes are cheaper. Also love the product, but since organising recurring orders customer service is zero. First order placed is still yet to be filled, with anything, three weeks later. Phone calls, emails, etc are either ignored or given false promises. A great Product, severEly let down by the level of customer service. We purchased two South Beach Smoke air starter kits in October. Both of which chambers broke in less than two weeks. Contacted customer service and was told they have problems with this particular product. The only option they gave us was to spend even more money on a different product. I left a review on their website detailing the issues we had with the air vaporizers which was of course negative. The review was never posted and when I log on to my account it’s gone. This is obviously the method that their company uses to maintain a high rating, just throw out the bad ones. i have been using sbs now for abt 1 yr or longer. The last batch of juice they sent me suddenly went dark which in turn lasts a lot less than usual. We called them and they offered m discount on my next purchase after requesting to have 3 bottles still sealed to be exchanged they refused to exchange them and issued a discount. Once the juice goes to a dark color it is almost tasteless, renders the filter useless like clogged up, last a lot less than the orange colored one. I have placed a new order and we will see what happens.will keep you posted. I agree customer service needs to be worked on for sure. The cartridges have little flavor, and taste like plastic. I really like the style and the convenience of getting a long and short battery but they really need to step up the flavor. Worst e cig I have ordered yet and they refuse to honor their 30 day “no questions asked” warranty. It’s like sucking air through a straw and the flavors are awful.